TentLife is about more than just campsite, fair weather and family camping. We also now do quite a bit of ‘wild camping’. 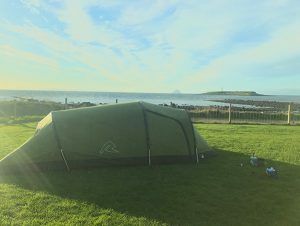 The Robens Voyager 3EX was the second backpacking tent we had purchased and we took it to Scotland and the Isle of Arran for a 4 night test and review. Our wild camping is most often carried out by 2 adults and 2 dogs, so we need more room than a typical 2 man tent could offer. Hence why we had been looking at and purchasing lightweight 3 man tents. Also, Mrs TentLife has a very serious back injury which requires her to need a good sized mat to sleep on otherwise she cannot move the next day. We had tested the MSR Mutha Hubba NX tent in Dartmoor. A brilliant lightweight 3 man tent that we will certainly be using again. You can check out it’s review here. We decided on the Robens Voyager 3EX not only because it was 3 man, but because of the front porch area. The Mutha Hubba has great gear storage both ends of the tent, but not really somewhere you could use (cook, make a coffee) if the weather took a turn for the worse. The Robens has a large front area with 2 doors, has an approximate pack weight of 3.6kg and seemed to fit our requirements nicely. It fitted into our budget and seemed pretty quick to pitch so we went ahead and bought one. So as we’ve said before and we will continue to say, when we test stuff we take it away and see how it fairs in the places it was intended to be used. 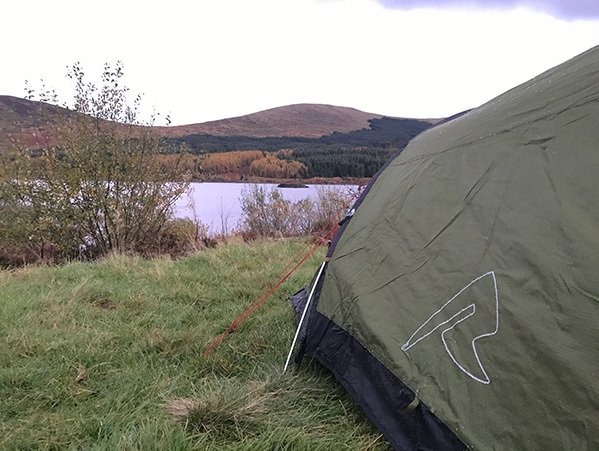 We took the Robens Voyager 3EX to Scotland for 4 nights. First night was a stop over at Loch Doon before we caught the ferry to the Isle of Arran. We headed north on the motorway and an hour later than we had expected (motorway congestion), we were pitching up near the remains of Loch Doon castle. Pitching was a piece of cake. 3 poles, all colour coded, pushed through their sleeves and ends slotted into place, corners pegged, inner tent clipped into position and we were done in only 5 minutes. 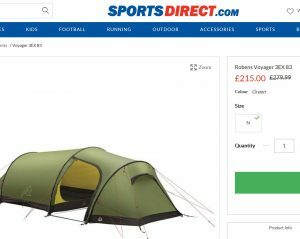 Do note here, that we rarely read the pitching instructions – this is always a good way of finding out how user friendly a tent is and how easy it is to pitch when you are in a rush (say because of weather or loosing light). We were trying some of the MuscleFoodUK high protein bagged meals and it was most pleasurable stiing by the side of Loch Doon, the campfire and the Robens tent and eating Venison Stew (from a bag with a long spoon :o). After our tea, we lay inside the spacious 3 man and watched the temperature drop and drop and drop. 0.3 degrees outside before I fell asleep in the comfort of my warm sleeping bag, decent kit makes all the difference. We had to be up at 6.30am in order to pack away and travel the hours drive to book ourselves on the ferry over to the Isle of Arran. The tent was thick with frost/ice both inside and out, something I’ve not experienced before. 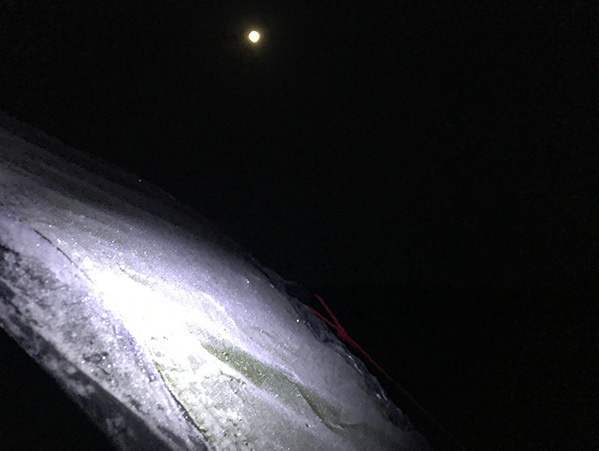 Also a new experience was packing away by moonlight, I’ve pitched tents in the dark (see the MSR Mutha Hubba review) but never packed away illuminated by the moon but at least we didn’t need a torch. The tent was down in no time even with having to shake all the frost off it and we made our ferry in plenty of time. We had split the pack weight between us, I had the outer and the groundsheet and Mrs TentLife had the inner with poles and pegs. We stored them in our dry bags and attached them to our backpacks. We were using the Ortlieb dry bags with integrated valves, so you can remove all the air from them and reduce the pack size, and having the tent split between two bags did make it faster and easier to stow away. We were soon on our way to Ardrossan to catch the ferry over to Arran. This is a beautiful place and would certainly recommend it for camping. We drove from the ferry to carpark near Brodick castle. We popped into to the Wineport pub for some lunch as hadn’t had any breakfast and the queue on the ferry was very long. They have some cracking stuff on menu and we settled on a steak panini and a coffee (always coffee). 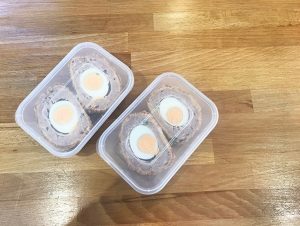 We even came away with some rather stunning (and large) Scotch eggs for tomorrow mornings breakfast. 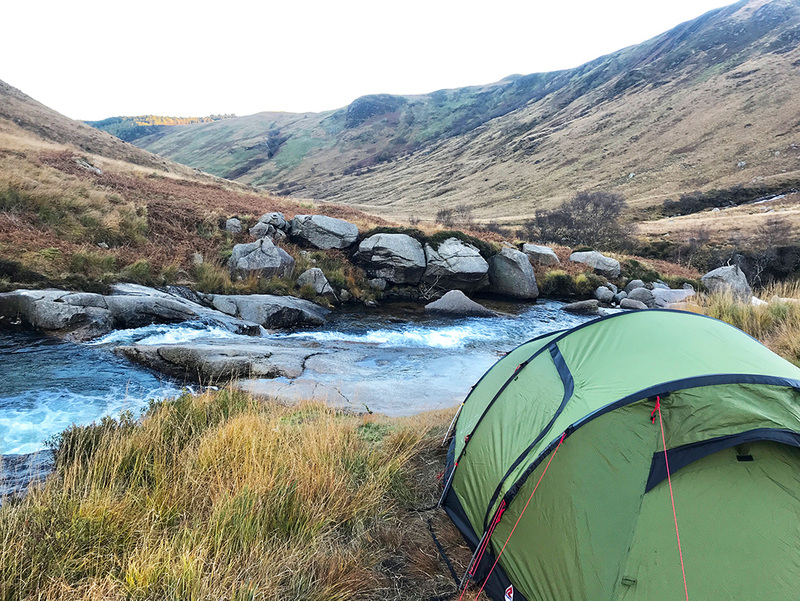 Our second night in the Robens Voyager 3EX was enjoyed in Glen Rosa with the stream right next to us. So after our pub lunch we got our backacks from the car and started our hike to find a suitable camping spot, and what a beautiful spot we found. Turns out that we had decided to pitch right next to what is known as the ‘Blue Pool’, and it certainly was wonderful. We managed to find room to fit the Robens, and although it’s not huge we we trying to get it on the flattest bit of ground we could so as not to be rolling around all night. The Robens was unscathed by the previous nights frost and being packed away slightly damp and it was soon pitched again painlessly, and in double quick time. We now got to experience the advantages of that big porch area of the Robens Voyager 3EX. The wind through Glen Rosa got particularly chilly whilst we were setting up, so we decided to make full use of the area and make a coffee. I had the front door opened at first and we had a beautiful view of the mountain range (not actually mountains) and Goatfell. However, as the wind picked up I bought the Coleman Fyrestorm PCS inside and closed the door a little. 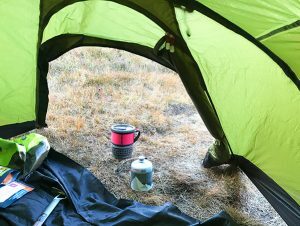 Many people may now be gasping saying that you shouldn’t be using a stove inside a tent, and this is mostly true but this porch area is more like a shelter and we made sure there was plenty of ventilation and no risk of fire. The discussion about tents and stoves will have to wait for another day/article. We were planning to camp in Glen Rosa overnight and then hike up to Goatfell (the highest point on the Island) and then head back down to the car and find another place to camp further round the coast. This hike didn’t happen, and the reason for that will be explained in another article. We woke up in Glen Rosa with the sun rising on one side and the moon setting behind the hills on the other. There was a small amount of frost on the tent but nothing like we experienced on Loch Doon. Because we had decided against the Goatfell hike, we were in no rush to pack away I took the dogs out and went and stood in the sun, waiting for it to move around and casts it warm rays on the tent. This would mark the time when I would make a morning brew. Question about dogs, how can grass be so interesting? Let’s just say they love exploring, and I’m doing my best to keep the brown thing out of the water before she bombs back inside the tent. The Scotch eggs were scrummy, as was the coffee using the water from the ‘Blue Pool’. We hiked back to the carpark via a slightly different route, and we sneaked in a little stop off for some scones and coffee next to Arran Aromatics and the Cheese Shop in Brodick. Not tent related but we drove to the north of Arran and stopped in at the Arran Distillery. We purchased ourselves a lovely whisky and some ciders for later (not all the whisky). We found a lovely place to wild camp with some fresh running water. Hopefully we would get to see a great sunset. So how did we then end up on a campsite? We were planning to stay at Seal Shore Campsite for our last night. The thought of a hot shower before the ferry journey and the long drive home sounded very appealing. The campsite site was down on the south part of Arran, so how did we end up there a night early. Well the nice wild camping spot I mentioned was a little too near the road and we couldn’t let the dogs off for a run. So the mistake we made was to drive along a little further until we found a better place. When we found a good spot, we thought “ooh we will just drive a little further”, and this kept happening – right up to the point where we eventually found ourselves right down in the south of Arran near to the campsite. So at this point we just decided to book ourselves into the Seal Shore a night early and reflect on the fact we should have stopped off sooner and been less picky. This campsite is brilliant, right on the coast with the lighthouse in the distance. Be warned though, the manager said that he was already having to turn people away for next year. Monday was a visit to Eas Mor waterfall followed by a visit to the pub. The campsite has a pub next to it, so after waterfall we accidentally found our way into the bar. There is an old Scottish Bylaw that states you cannot camp within 500 metres of a pub without going in for a beer (this is a true lie). Typically it rained whilst we were packing away, but at least this was only a small tent and we just hung it over our washing line to dry when we got home. Goodbye to the Isle of Arran. We have 2 dogs who love hiking and adventuring with us. We have a Beagle and a Brown Thing and even if Brown Thing wasn’t actually brown then she would be as soon as she gets off the lead. She is attracted to water mud and dirt and is a very very happy little soul. There are many people who wild camp with their animal friends and the space they need has to be factored in when purchasing a tent. Our young dogs aren’t very big, and dependant on the weather they either sleep between us or snuggled up near our legs for bodyheat. The Robens Voyager 3EX has plenty of room inside for the grown ups with our sleeping mats and the dogs with their blankets and insulation. It was definitely not cramped inside, and we all had plenty of room to move around and get comfortable. 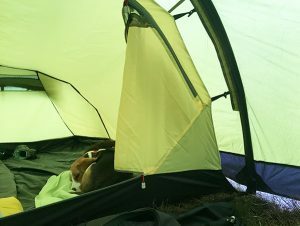 The dogs were very happy (and worn out) in this tent during our Arran trip and once they found their cosy spot they were fast asleep and getting ready for the next days adventures. The Robens Voyager 3EX is waterproof to 5000mm HH (Hydrostatic Head) with fully taped seams. It also has flat pole sleeves to make it more streamlined in the wind. There is a vent at each end of the tent offering excellent ventilation. There are lots of guylines on this tent, meaning that it should be pretty stable in bad weather. There are also some nifty guyline retainers, not something I have come across before. These are really handy as they stop the guylines getting knotted up when packing away and being stored. Just roll up each guyline and then tightened the retainers to hold them neatly in place. They do work great, the guylines didn’t get tangled and did make pitching faster. The head room in this tent helps make it easy to move around, you can sit up in it easily without touching the top. The sleeping area is 225cm long, giving us more than enough room at either the head or foot of our mats to put our gear and rucksacks (and beer bottles) if needed. The groundsheet is thick and has a very waterproof 10000mm hydrostatic head. The inner sleeping area is light yellow in colour, and hangs inside via a toggle system. Each of the four corners clip onto the lower part of the tent and the rest is suspended via 2 ros of toggles (back and front). This system allows for the inner to be removed and refitted quickly if necessary, however you can pack the Robens away with the inner left in place. There is a ‘gear rope’ in here which is designed for hanging your damp clothes on. We used it to hang our lantern from, it was really handy that we could slide it from one end to the other. There’s a storage pocket on each side of the inner area, and the inner door has a 2 way zip on it giving it plenty of open/closed/half open flexibility. Also the top half of this door has a zipped mesh panel so you can open it up when the weather is warm and not let any bugs in. When you do want it fully open, there is a large mesh pocket to stow it away into. The porch area is very roomy with dimensions of 165cm x 195cm and a good head height. It has 2 doors, one at the front and one on the side. The side door also has a mesh panel, which is great for ventilation whilst keeping the bugs on the outside. Plenty of space for storing gear as well as cooking when the weather calls for it. Overall this is a light 3 man trekking/backpacking tent with alloy poles, a pack weight of 3.6kg and a size of 47cm x 20cm. This tent comes in its own waterproof drysack (we’ve tested it), which is a decent size making it easy and fast to pack away. You do have the option of leaving the inner sleeping area in place, but as we were splitting the tent between 2 backpacks we took it out and split everything into two Ortlieb drybags. The ventilation in this tent seems to be excellent. 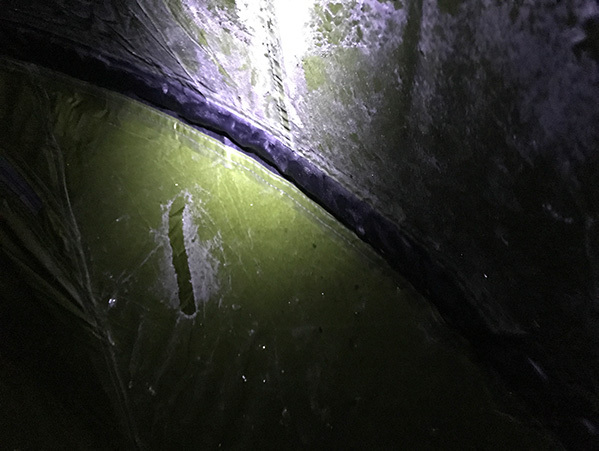 As it was October (and Scotland), it got dark rather early and we spent long evenings in the tent chatting (and drinking whisky), but the tent didn’t suffer from condensation at all inspite of the cold weather outside. Having the front porch area on this tent makes it really versatile for many different weather conditions, storing your gear and cooking too. Although we’ve only used it for 4 days so far, it has experienced ice, rain and a bit of wind. It was very reliable and effortless to use. We are looking forward to getting out in this tent again very soon. The manufacturers spec and other reviews we have read say that the Robens will cope well with high winds and gales. I must say that the build quality and design of this tent does instil us with confidence that it will cope very well. Its quick and easy to pitch, robust and spacious – A very capable tent, perfect for 2 person and 2 doggo activities and we cannot wait to get out in the Robens Voyager 3EX again as soon as we can. Read more about Robens Outdoor Tents << Here. Phils’ First Wild Camping Adventure!